I was thinking of a title for this story and realized very few people will know where I was visiting. So let’s start at the beginning. The public relations firm Eleven Six (named after the principal’s eldest daughter’s birthday- November 6th) represents many hotels and destinations. When they sent me a list of their clients I noted one of interest: Emerson Resort & Spa in Mt. Tremper NY, about two hours from NYC and 20 miles from Woodstock, in Ulster County. There are two properties at the resort which are both family-friendly. The Lodge is ideal for families and outdoor enthusiasts surrounded by an outdoor pool, dog park and children’s playground. The Inn is a more luxurious experience and the center of most activities. The Inn contains the front desk, spa (steam & sauna as well as an outdoor Jacuzzi), fitness center, conference center and shops. I am writing this while sitting outside the café that features snacks, salads, sandwiches, ice cream, etc. Additionally, there are shops featuring outdoor equipment, seasonal rentals, a general store, antiques, toys, and fashion. This area also contains the world’s largest Kaleidoscope (who knew?) housed in a 60-foot tall silo and opened in 1996. The 10-minute presentation features three-38 foot mirrors and the show is free for guests ($5 for others). I was told that the best angle is lying on one’s back on the floor and looking straight up. I am not making this up. 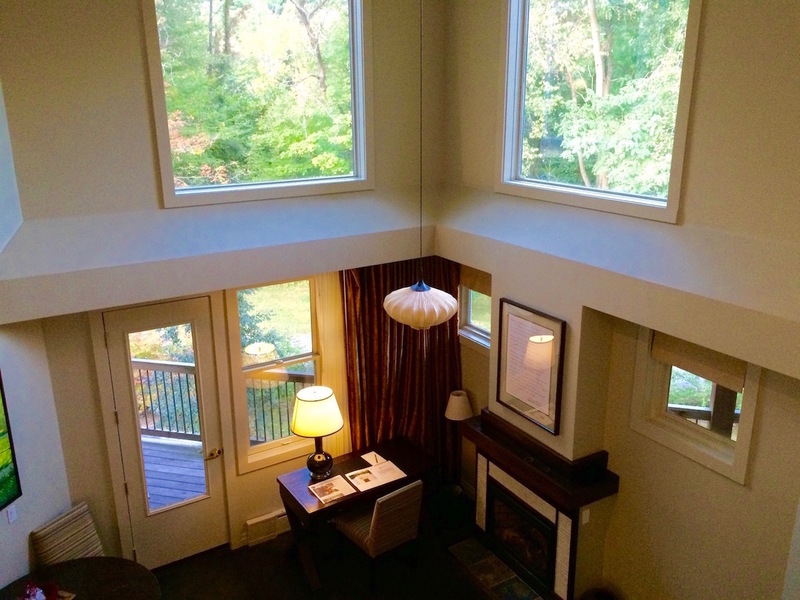 There are 26 suites in the Inn and 27 lodge rooms. I had an Imperial Suite loft with a king bed, two bathrooms, a gas fireplace, an air-jetted tub and a Swiss Rain shower with a private deck that had views of Mount Tremper and Esopus Creek. 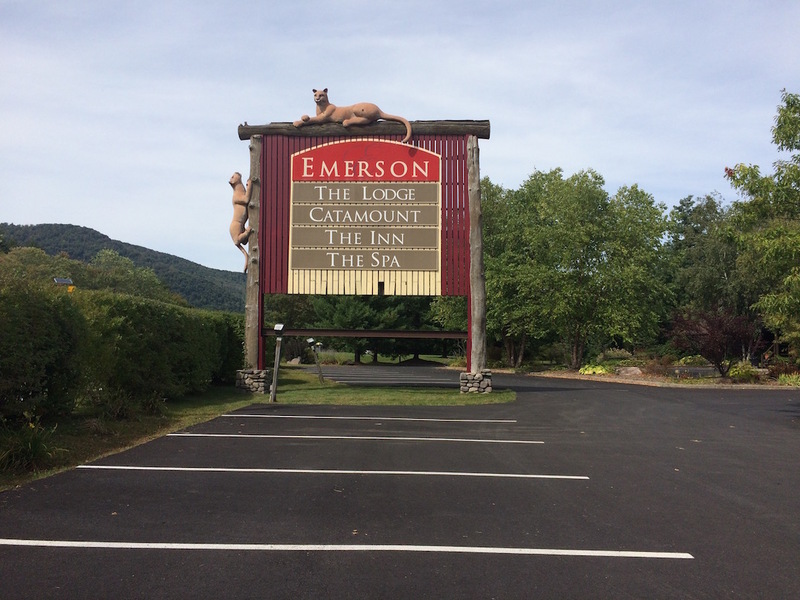 True, the Catamount restaurant is a brisk walk from the Inn but they are constructing a new restaurant to be called Woodnotes Grille that should open this holiday season. The old Inn building burned down in 2005 and was replaced by the present Inn in 2007. At the east end of the property are 1.2 miles of trails available for cross country skiers or snow shoers. During the summer months it is perfect for hiking. Behind the property is Esopus Creek that is used for fishing and tubing and Emerson Pond which is stocked with bass and trout and converted to ice skating during the cold months. I was invited to spend three days at the Emerson, arriving and leaving by Trailways of NYC (a three hour bus trip with stops). The staff, including Tony Lanza (COO), Kayleen Scali (PR) and the entire front desk staff (especially Chris) arranged courtesy transportation everywhere I had to go in and around the Inn. 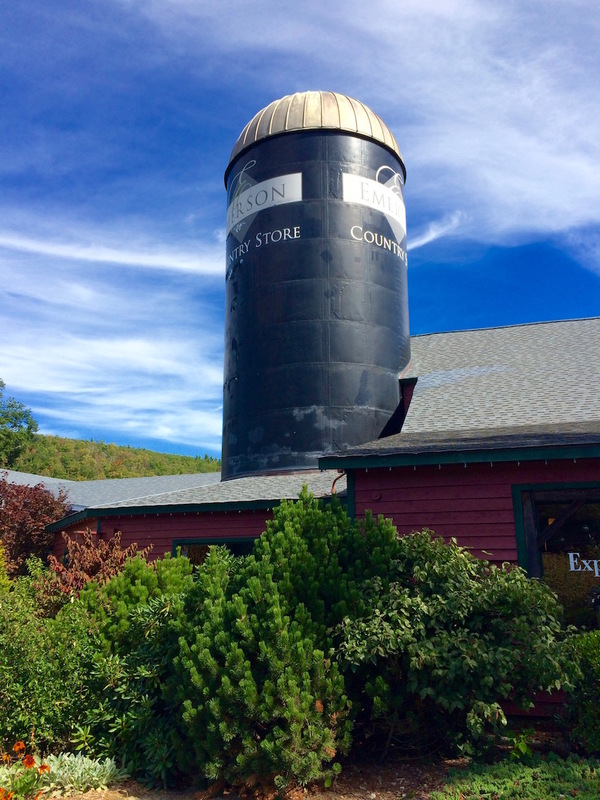 I had one breakfast and dinner at the Catamount Restaurant and one lunch at the Country Store Café. In addition I ate lunch at the Phoenicia Diner, located outside the town of the same name. Built in 1962 and moved to the Catskills in the early 1980s it doesn’t take reservation and is always packed. Owner Mike Cioffi explained that they use local produce and fresh food sourced from the Catskills and Hudson Valley area. I then spent two hours in the town of Phoenicia that Budget Travel Magazine included as one of the “Coolest Small Towns in America”. The town is basically three blocks filled with funky shops and restaurants. 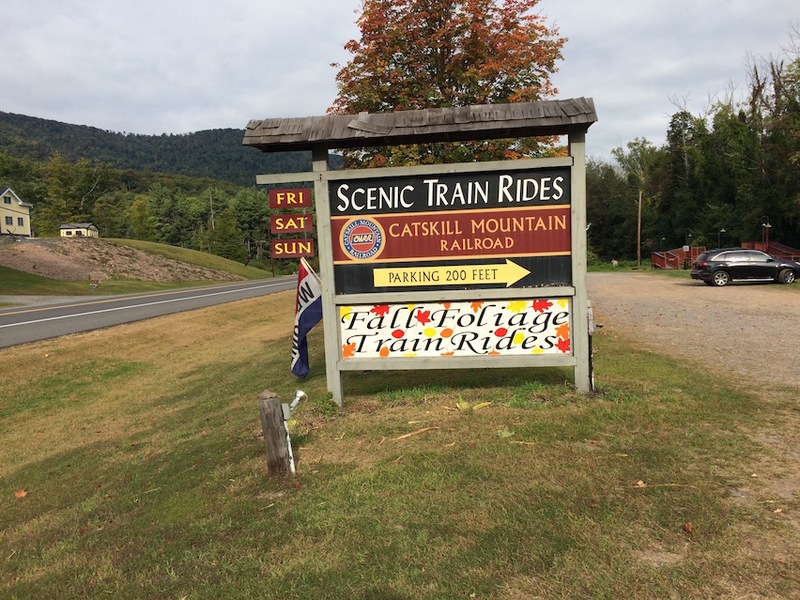 The Catskill Mountain Railroad stopped at the Mt. Tremper station that borders the Emerson property. The hour-long trip in open or closed cars stops for 15 minutes at the Empire State Railroad Museum in Phoenicia where one of the volunteers explained that the railroad originated in 1866 and was re-chartered in 1982 to run tourist trains as well as freight service. They are headquartered in Kingston. The cost is $14 for adults and $8 for children 4-11. Mount Tremper Arts (MTA) supports contemporary artists in the creation and presentation of new works of art. Founded in 2008 it is an artist-run space that utilizes an integration of performances, exhibitions, artist residencies, and hybrid food and art programming. Check out their schedule before you come to town. I have had massages my whole adult life (I am 80) and never have I met my match until Gia M. Polk worked on my body with a deep tissue massage with hand and foot reflexology. Her hands of steel made me cry uncle several times. This was a first for me. Gia uses myofacial release (MFR), which is a soft tissue therapy for the treatment of skeletal muscle immobility and pain. It is effective when it increases the range of motion and joint flexibility. She has the client participate with active resistive motions that help release the muscle fibers that are stuck. She is a Reiki Master. Reiki is a Japanese technique for stress reduction and relaxation that also promotes healing. It is administered by “laying on hands” and is based on the idea that an unseen “life force energy” flows through us and is what causes us to be alive. If one’s “life force energy” is low, then we are more likely to get sick or feel stress, and if it is high, we are more capable of being happy and healthy. After my treatment I was walking tall and did not use my cane for the rest of the day (neuropathy, titanium knee). I will remember my time at the Emerson fondly, both because the resort had the best of all worlds and because Gia made me feel young again.